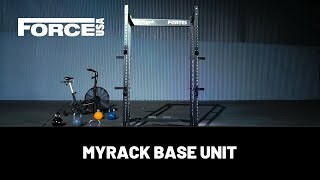 The Force USA MyRack Lat Pulldown/Row attachment is a perfect addition to your MyRack, taking up very little space at the back of the unit and allowing for a multitude of exercises. The MyRack Lat Pulldown & Low Row attachement is unmatched in its class and will give you solid and intense Lat pulldown, Tricep pushdown, Low Row and overhead cable workouts for many years to come! We have also included standard and olympic plate adapters so you can utilise 32mm and 50mm plates. With safety being our number one priority, the weight sleeves also feature a unique welded support bracket and safety stopper to provide an added degree of safety and structural integrity while performing to your max load. Easy to install and the unit slides ok for a home unit however the plastic sheathing for the steel cable has already split after 3 weeks. I had to cut a large section off to stop it fraying any further, which is a concern as the steel cable will cause unnecessary wear on the pulley. Still perfectly usable but a bit disappointing.